Very nice, love the sunlight in the water. Wow! The detail in the gate, the sky, the overall composition. the Nik processing .. and above all the lone tree conspire to extract a thousand faves from me! Lovely composition with the fence and sunlight in balance, and that little lone tiny tree bringing my eye into the image more deeply. There is so much to see here, even though it howls simplicity. Fabulous perspective. I like this very much. B & W works really well. I love this - a feeling of freshness, warmth and beauty! Monochrome really brings out details you wouldn't notice as quickly in colour. I love the detail in the gate and the lone bird sitting in the tree watching the ocean. Beautiful, these nik filters look pretty cool too, bet you spend ages deciding which one! A beautiful B+W capture of this wonderful start of a new morning. Absolutely gorgeous. 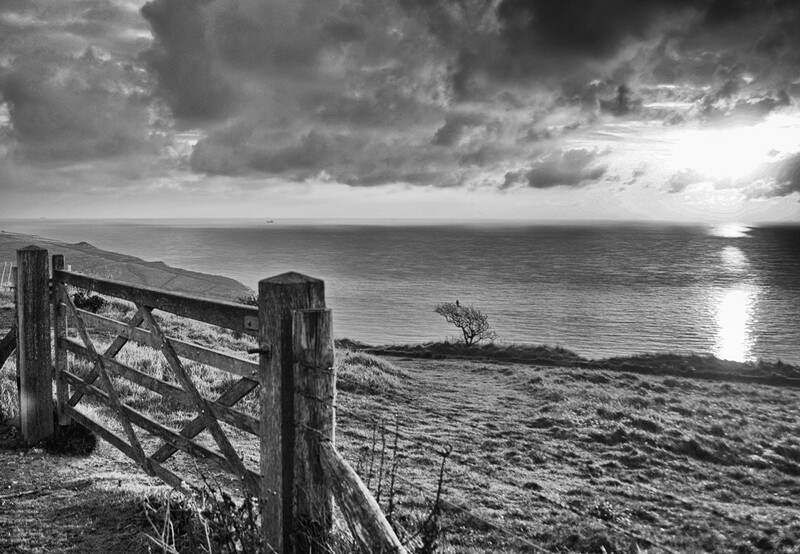 Love the composition and view and great choice of B&W. Fav! Great b&w, the textures and tones are very good. The b&w really show a lot of contrasts. I like how you composed this and your choice of making this b/w! FAV! Lovely composition with the three layers of depth across the page. The filter really gave a great final image too. Very nicely shown and composed. A super composition and I love the editing. I can only echo all of the previous comments. Wonderful image! Fav. The old barns here are all painted black. They used coal-tar.